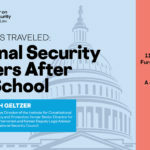 On Tuesday, April 16, the Reiss Center on Law and Security and the National Security Law Society will host this semester’s final session of A Road Less Traveled, our career series featuring national security law and policy practitioners. We’ll be hearing from Joshua Geltzer, Executive Director of the Institute for Constitutional Advocacy and Protection at Georgetown Law, which focuses on constitutional impact litigation and public education on everything from whistleblower protections to the travel ban to DACA. 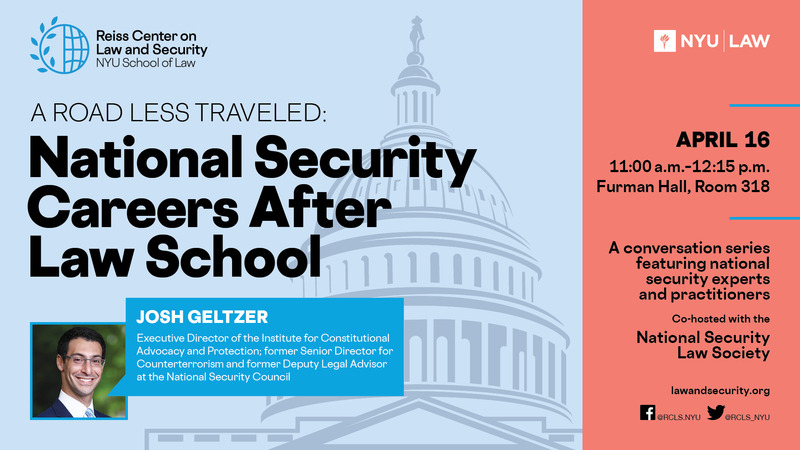 Geltzer has had a wide-ranging career following law school: prior to his advocacy work at ICAP, Geltzer served in the Obama Administration as Senior Director for Counterterrorism at the National Security Council. He also served in government as a national security lawyer, including as Deputy Legal Advisor at the National Security Council and before that as Counsel to the Assistant Attorney General for National Security at the Department of Justice. His work in government spanned issues such as closure of the detention facility at Guantanamo Bay, the counter-ISIL campaign, and Americans held hostage overseas. He was a law clerk to Supreme Court Justice Stephen Breyer. Additionally, Geltzer is an editor of Just Security and has been a prolific public writer, appearing in The Atlantic, Foreign Policy, Politico, and the Washington Post, among others. He can be found on Twitter at @jgeltzer. Josh will be sharing insights on his constitutional advocacy work, experience in government, and advice for law students on navigating national security careers and making an impact both in and out of government. Please join us on April 16 from 11:00 a.m. to 12:15 p.m. in Furman Hall, Room 318. Food and drinks will be provided.